sailboat. 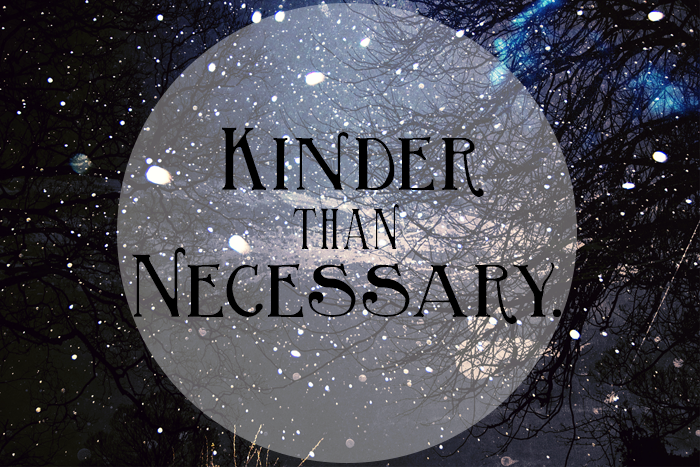 : On being kinder than is necessary. “If every person made it a rule that wherever you are, whenever you can, you will try to act a little kinder than is necessary - the world really would be a better place." And I understand that it's simply not possible for everyone to like each other. Personalities will clash and opinions will differ. But does not liking someone mean that you can't be kind to them? I suppose that's something that depends on what has happened previously. Maybe they did something that you can't forget about. I understand that and I don't think that makes you a bitter person. Sometimes I say things that I don't mean on purpose. Sometimes I'm incredibly selfish and don't consider other people's feelings. Sometimes I'm too stubborn and won't do something that I don't want to, even if someone else really does. We all make mistakes. But ultimately I think it's important to try to be kind, always. Even when it's difficult. Especially when it's difficult. i adored the quotes and thoughts throughout this book, it was beautiful, i took alot on board. I love this post, it is a bit of serendipity/an auspicious sign as just as I started reading this I got an email via Goodreads from someone recommending this to me so it's now on my must-read list! I love that rule and it's something I really need to work on. I try generally to be a kind person but I know that I am especially kind to my close friends and family and perhaps not always so kind to those who get on my nerves or aren't my favourite people to spend time with, so I need to work on being kinder all round. Especially when it's difficult - love that. I was thinking, hmmm I recognise that quote. That's because I read Wonder this week too!!! It's a lovely book isn't. And I think everyone could do with being kinder than necessary. A mantra I will take with me through life too. I've had this book on my mental list to read for a while now. I think I picked it up in a book shop a good few months ago and read the first chapter being pulled in straight the way. I like what you've gleaned from the book and you're certainly correct, it's important to remember that we are all human at the end of the day. I really want to read it!! !=)lovely post Jennie!!! I've never read the book but maybe I should! It's good to be kinder than necessary, and I sometimes forget. Especially when I'm in a hurry! P.s. I've just read all your "Ralphie's Diary" posts and they are just adorable! He is the cutest little fluff ball. I have a ginger bunny called Archie - I wonder what his diary would look like! Ive always loved that quote :) The book looks like a good read. Looking it up now. Everyone should keep this in mind. And it's not weird that you're selfish sometimes, or stubborn, that's what makes you human! I haven't read the book, but I totally agree with that quote. It is difficult, specially if you are having a bad day, to remember the importance of being kind and sharing love. Kindness is contagious, and maybe one day we will all understand that and we'll try to leave our worries aside and face each day with good feelings and smiles. I completely agree and I want that book. I always try to remember the quote 'Be kinder than you feel'. I'd quite like a little print of it as a reminder. Love that quote, what a great post! Sounds like a book that I need to read! Such a wonderful quote. I wish that everyone could just be kinder to one another but I admit that sometimes it's difficult if there's a bad history. In those situations, though, I just smile and move on. I had read the quote "always be a little kinder than necessary" before and I didn't even realise it comes from a book. I think it's such a wonderful motto to live by though - I think if everyone was politer to each other (even just saying "hello" to a stranger you walk past in the street every day, or letting someone go ahead of you in the queue for the train, or paying someone a compliment), was more patient with each other, and - it's a cliché for a reason - always at least tried to treat others like how they'd like to be treated, society would be a much nicer place to be. It's a good rule to live by. I aim to do that at work, things are very difficutlt there and I think being kind to my colleagues is making a bit of a difference! I think this is a good thing to remember! However I think it's also important to be selfish every once in a while. I get taken advantage of sometimes as I'm always trying to please everyone else. Although hopefully it's possible to be slightly selfish and kind, as I would hate to think that becoming more selfish would make me a worse person! Wonder is such a awesome book! I think it it so important to remember to try one's best to be kind to everyone. Lovely post Jennie! We all could do with being a little nicer sometimes! I loved this post, definitely going to have a look at this book. This is such a lovely post and something I think so many people forget. We get so caught up in life, we forget to live and do to others as we wish we were done by. Thank you for the recommendation, I'll definitely check it out! I just stumbled upon your blog and I can't wait to see more!